We know our vinyl is much better quality than the box stores, and we’re proud of the quality product we offer. However, we were pretty surprised recently when we delved a little deeper and took the actual weight of a couple of their panels and compared it to ours. Ours weighed 30%-40% more per foot! We knew our product was a lot more dense, but we were surprised that the weight was so much more. 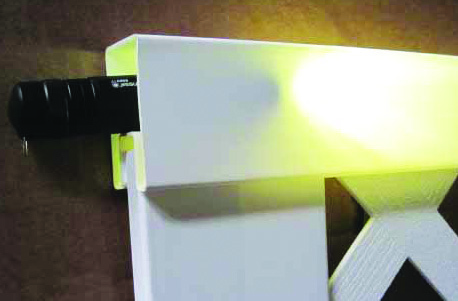 Shining the same flashlight in a WamBam rail illustrates the thickness of the vinyl. Since we notice fencing of all kinds when we drive around in our daily lives, we often see homes with box store fences that look translucent in the sunlight. In other words, they are so thin that the sun shines through. The price may be right, but the age old truth “you get what you pay for” holds true. This thin product will not last, which means you’ll have to replace it way sooner than you want to, resulting in additional time and money. Just make sure you do all your homework when buying a vinyl fence. You want a product that will perform consistently over the lifetime of the product, and our lifetime guarantee gives that peace of mind. There are many great manufacturers in the fence industry that extrude a quality product, so even if you don’t choose our fence, just make sure that you choose one that will stand the test of time- and won’t act as an outdoor lampshade! Voting for the 2012 Photo Contest begins now! 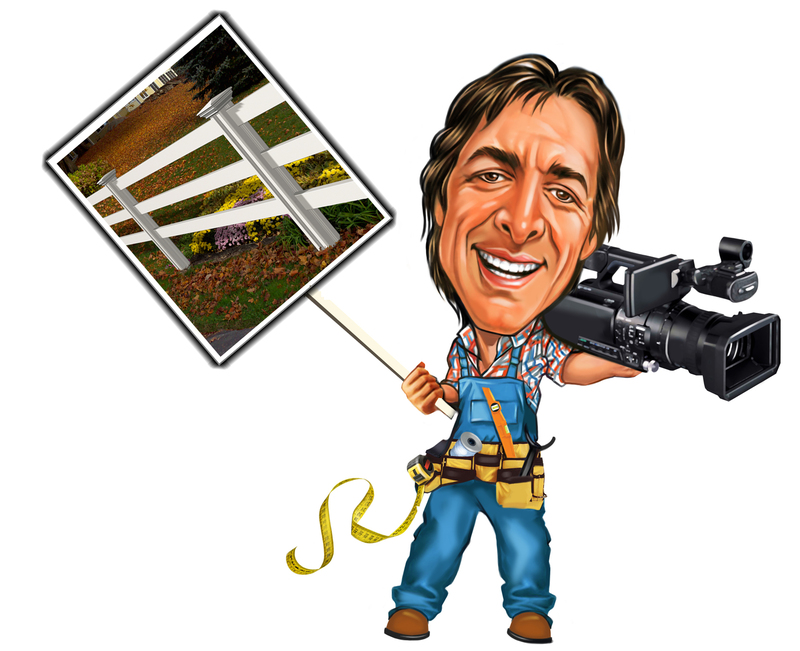 January may be a drab month for some, but here at WamBam Fence we like it because it means that it’s time for our annual photo contest. 1. We have chosen the top 25 submissions based on images, variety and overall project. 2. We have posted them to a special contest album on Facebook that can be found by clicking here. 3. The entries with the most likes are the winners. We have three cash prizes: 1st gets $500, 2nd gets $250 and 3rd gets $100. Checks will be mailed to the winners within one week of the contest closing. This fabulous entry was emailed by a customer of ours. We have left every word unchanged; we only added formatting, headings and picture titles. A special delivery comes to the door…what can it be? I was near the window, so I saw it first. The truck stopped right in front of our driveway. It was a bright, sunny day so I knew I would be able to see what was to be unloaded. Bob helped the driver unload a bunch of boxes that were on a wooden pallet. They pushed the pallet load of boxes into the garage and out of my sight. What could it be? Bob and Fran work on their computers while watching TV. Packages seem to come to our house every few days and more often as Christmas approaches but they always get placed on the front porch, never do they come in a big truck and go into the garage. I heard Bob and Fran talk about a WamBam fence but they talk about a lot of stuff. I knew they were thinking of putting a fence around our yard. They talked about a picket fence and went to several stores to see and touch them. One of the stores sent a man to our house to talk about installing a fence. Bob and Fran didn’t look too happy when he told them he could install a picket fence around our yard for about $4,500. After one of Bob’s conversations with WamBam, he got a box of pieces of WamBam fence parts so he could touch them. He started smiling when he and Fran talked about the quality of the WamBam parts he had in his hands. He smiled even more when the WamBam folks told him the cost of the Jiminy Picket fence would be about half of the cost he got from the other fence people. After Bob and Fran saw and felt the sample WamBam parts, they looked at the WamBam website over and over. They even held several IM conversations with Denise and Linda over the computer to talk about parts, delivery, dimensions, and lots of other stuff. Bob and Fran were very impressed by the level of service the WamBam people offered and they hadn’t even bought anything yet. Bob made a drawing of our yard and e-mailed it to the WamBam folks. Then, he talked to Stephen at WamBam about how to do certain things like gates and posts and stuff. Stephen was a great help on the technical parts of the project and really enjoyed looking at Bob’s drawing that had lots of dimensions on it. It was getting colder outside so I thought the fence project would wait until next year. This is For Us?! We Feel So Loved! When Bob and Fran say the word “outside” to my brother and me, we always jump off the couch and run out the sliding glass door. It’s great to feel grass under our paws. My name is “Gus” and my brother’s name is “Toby.” We’re rescued dogs that Bob and Fran adopted. We like “outside” for lots of reasons. Little did we know, that truck delivered us a Christmas present early in the form of more “outside” than we could imagine. The whole family hard at work! One Saturday, Bob, Fran and Abby (one of their daughters) started running colored strings around the yard. Along with the helpful WamBam people, Bob and Fran enlisted the help of several people on the project; one friend had a laser level that allowed them to get the fence installed level all the way around the perimeter of our yard.Bob, Fran and Abby next pounded a bunch of metal poles into the ground. Bob did most of the pounding this day but, Fran and Abby helped out quite a bit. 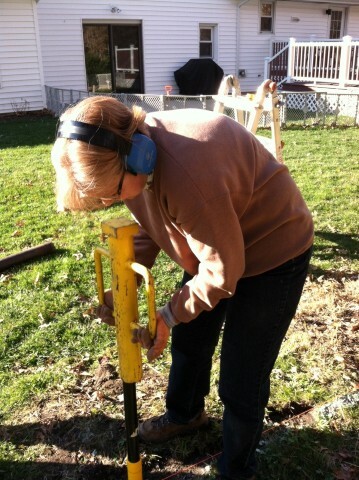 Bob and Fran had installed other fences in the past where they had to dig holes and pour concrete. Bob wanted none of that this time around and I think that is the reason why it took a while for us to get a bigger “outside”. The WamBam instructions that came with the fence said that having a helper to pound in the posts would make it a little easier task. Bob found that out the very first day. So, Bob asked Brandon to help with the next round of pounding. Brandon is the husband of Lisa, Bob and Fran’s other daughter. The WamBam instructions are very clear on where to place the posts, how to measure the distance to next post, where to place the gates. They are also very clear that pounding posts takes some thinking about safety so as not to get hit on the head by the post pounder. I know Bob read that page because he laughed when he saw the diagram WamBam drew of the bammer hitting the person. Bob was not laughing on Thanksgiving morning at 10:00 as he was sitting in the Emergency Room. Yep, Bob was under the bammer when it was coming down on the post being driven into the ground. Four stitches later, Bob was back at our house ready to eat turkey and stuffing. Real friends help pound pipe. But real friends don’t let friends use a non-WamBam pounder or said friend might end up in the hospital! Bob was able to laugh about it, too. He wasn’t hurt all that bad. I heard him laugh a few days later when another package arrived from WamBam. It was a piece of railing. One of the original railings was broken during the shipping process. Bob called WamBam and they replaced the railing right away. 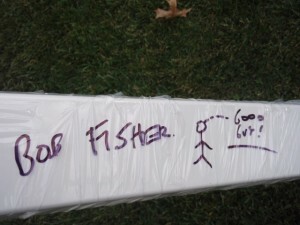 One of the WamBam people, Bob suspects Stephen, drew this picture on the shrink wrap covering the replacement railing. Bob and Fran knew they had a made the right decision to install a WamBam fence when they saw this and experienced the fantastic products and customer service WamBam delivered. A mysterious person at WamBam can’t help but remind Bob of his head injury….. The next nice day, Bob, Fran, Abby and Lisa installed the rails and the pickets. This project has been truly a group project. While Bob, Abby and Lisa installed the rails, Fran had the job of gluing the peaks onto the pickets. Each section of fence has 13 pickets and we have lots of fence sections. Fran is a glue expert now. She perfected her technique early in the process so there is no excess glue running all over the pickets. The garage smelled funny every time she glued the parts together. Ventilation is really a must if you do the gluing inside because of cold weather like we had to. Bob called one of his best friends to help and a few weekends later, Mark arrived. Mark, Bob and Fran pounded the rest of the poles into the ground. The WamBam instructions told them to wear hearing protection while pounding in the posts. Bob should probably have worn a hard hat on Thanksgiving Day, too. The WamBam website stated their fence was fun to install. Bob agrees as this photo shows. 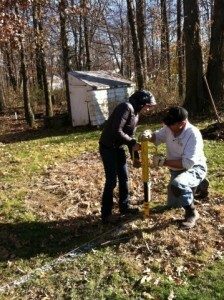 Keeping the poles plumb while driving them into the ground was not as hard as you would think. But, we had a few that ended up not quite as plumb as Bob would like, so WamBam’s fantastic leveling doughnut allowed the post covers to be installed exactly plumb even if the pole itself is off a little bit. 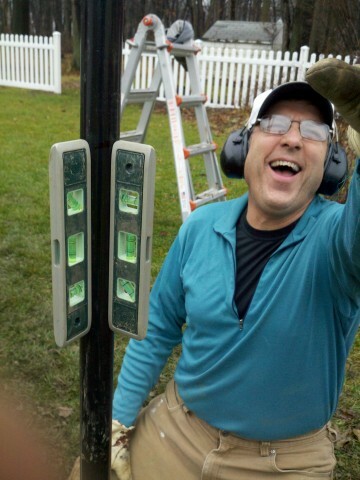 Looks like Bob is actually having fun installing his fence, stitches and all! Snow and winter interrupted the install of the gates into the fence. Bob and Fran assembled the gates in the garage but there they sit until the next warm day. We still get to go to our new, bigger “outside” as Bob used some of the old fence where the gates will go. The project is almost finished so Toby and I are very happy with our new “outside”. We run back and forth and play with our friends that stop by to run with us. 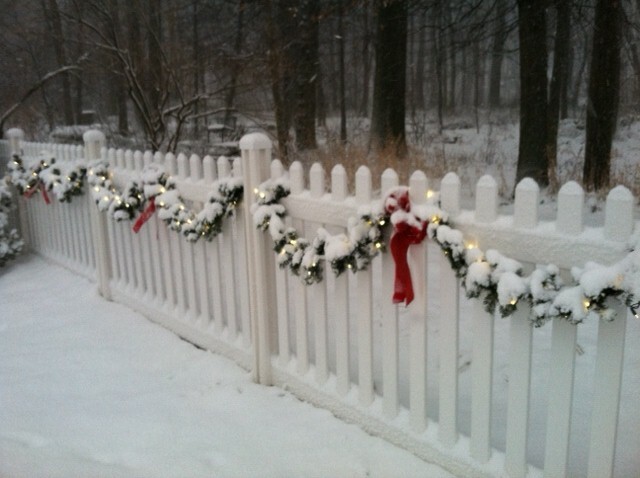 Fran even decorated the fence with garland and lights for Christmas. It’s so pretty. Maybe she will keep the fence decorated all winter long. Bob got a new 18v cordless drill out of the job and we got a new fence that gives us a bigger “outside”. Here’s what I see from my perch inside the house looking out the window. It’s my favorite spot in the house made even better by the new WamBam fence that gives us a bigger “outside”. In the end, Bob says the WamBam instructions and web videos are great. Customer service is fantastic as the people are very knowledgeable and friendly; shipping was timely. 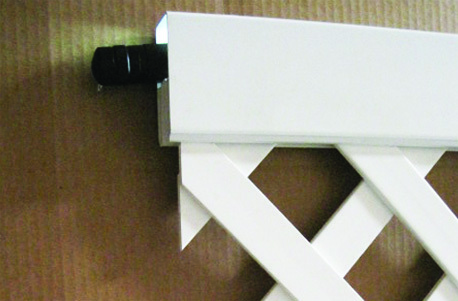 The quality of the WamBam fence parts is better than the big box store fence parts. The fence was fun to install. No digging was perhaps the best part. 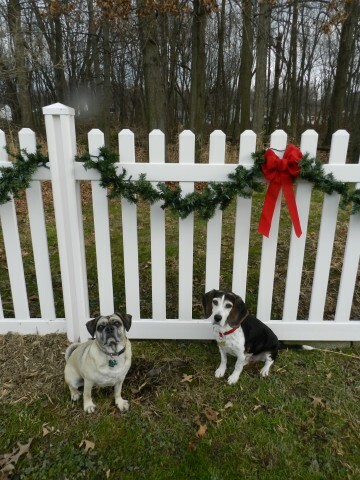 Merry Christmas to Toby and Gus…and a job well done!